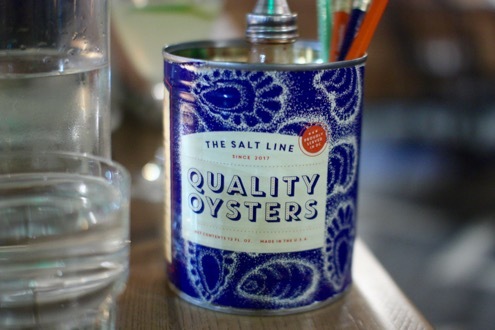 We first visited The Salt Line back in November for Rachel’s birthday and recently returned for brunch, leaving both times with a smile on our collective faces. Chef Kyle Bailey, formerly of Churchkey and Birch & Barley, helms the Navy Yard kitchen that’s directly across the street from Nationals Park. 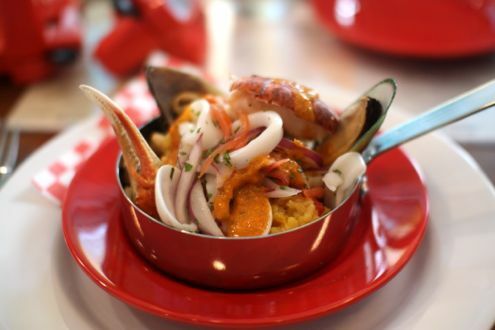 Focusing on classic New England fare, The Salt Line is one of the best additions to the Washington dining scene in the past year. We started Rachel’s birthday dinner with their Peconic Bay scallop crudo which was topped with pickled cranberries and spiced pecans. 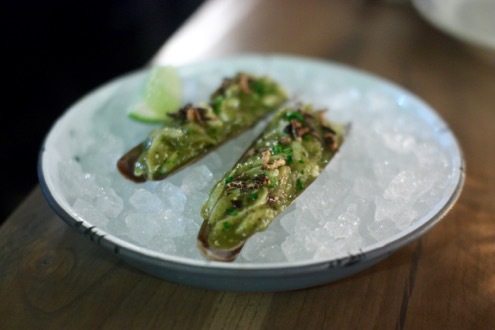 The next selection from the raw bar was their razor clam ceviche. Prepared with charred tomatillo, jalapeno, and cilantro, the ceviche was another worthwhile appetizer. 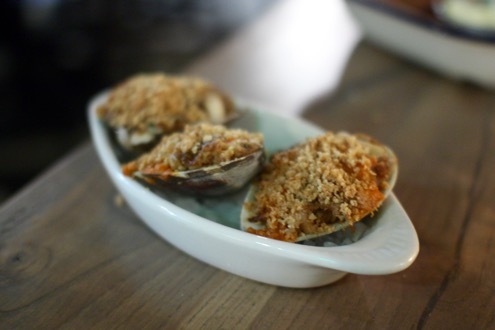 The Stuffies, a trio of baked middleneck clams, smoked linguica, lemon, breadcrumbs, and parmesan, was a standout dish. 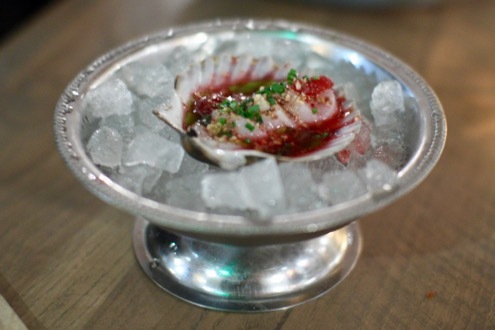 A whimsical take on Casino Clams, I can see why this is one of their more popular menu items. For our entrees, I opted for the eel cacciatore buccatini. Prepared with barigoule artichokes, hen of the woods mushrooms, and idiazabal cheese, the meaty pieces of eel wonderfully complemented the thick, freshly-made pasta. Rachel went for the classic lobster roll, and how could you not? 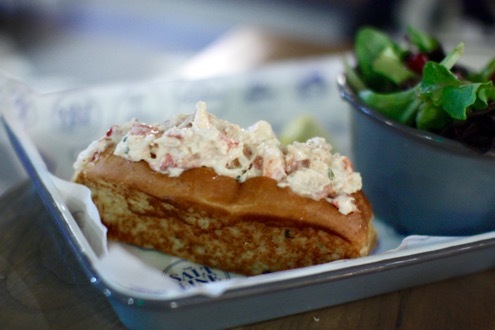 Dressed with just the right amount of mayo, the roll is generously stuffed with an abundance of lobster sandwiched between the warm, toasty bun. 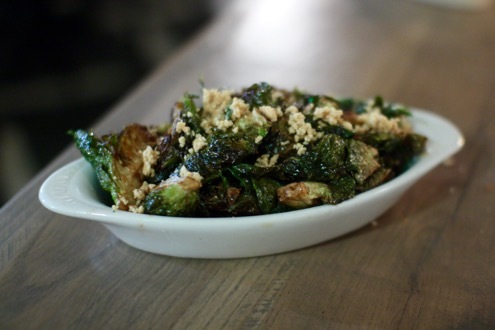 We also shared an order of roasted brussels sprouts. Prepared with maple syrup, sriracha, fish sauce, and peanuts, this is one of the best preparations of this popular side dish in the area. 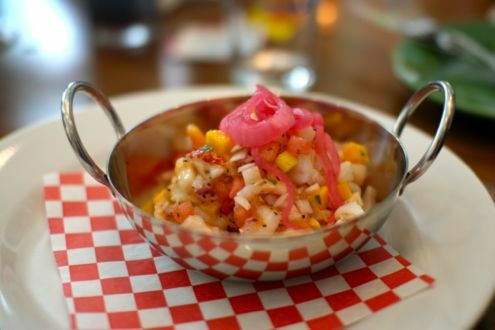 Just a few months later, we took friends that were visiting from out of town to Salt Line’s weekend brunch service which was equally as delicious as our previous dinner here. First of all, be sure to order a batch of Parker House Rolls. 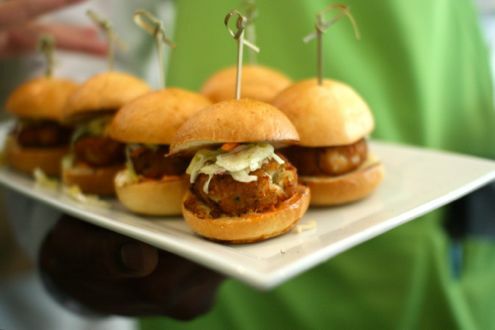 These freshly baked, flaky rolls are a delight to share amongst your party. 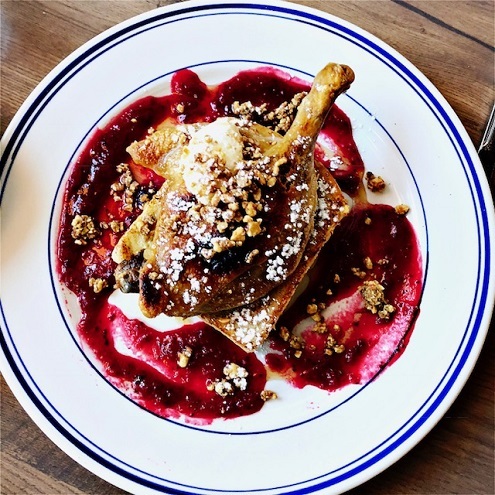 The crispy duck confit is what a decadent brunch dish is all about: a slice of French toast topped with a crisp leg of duck and accompanied with cranberry orange sauce, honeyed walnuts, and whipped mascarpone. Rachel’s Eggs in Purgatory was a New England interpretation on Shakshouka as the baked eggs were blended with clamato, middleneck clams, linguiça sausage, and a creamy polenta. 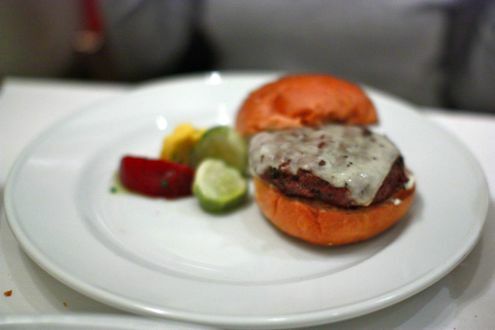 My favorite dish, however, was the New England Smash Burger. I tend to stray from superlatives but this is one of the very best burgers you’ll find in the District. Featuring two ground chuck patties, two slices of American cheese, lettuce, tomato, pickle, and mayo and sandwiched on a crispy potato bun, this is the quintessential burger. 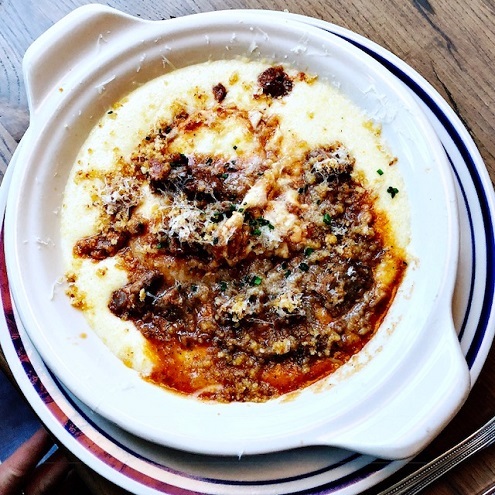 The Salt Line is an outstanding addition to the D.C. dining scene, and given that they excel at both dinner and brunch, we’d recommend Kyle Bailey’s homage to New England cuisine in a heartbeat. We’re also very excited about the new outdoor lounge they’ll be adding just in time for MLB Opening Day. It’s going to be quite the happening spot come baseball season. 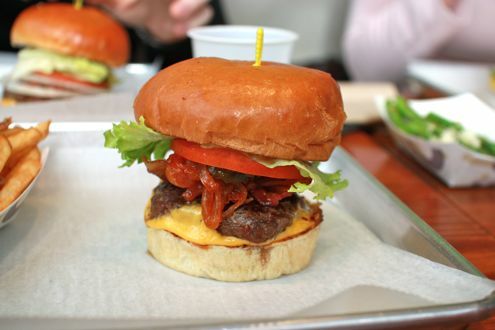 Rachel and I finally ventured out to the recently-opened Kraze Burgers in downtown Bethesda last weekend. The Korean-based chain decided to open its very first United States location in the Washington suburb, but is also planning to open several more stores in DC as well as Virginia. 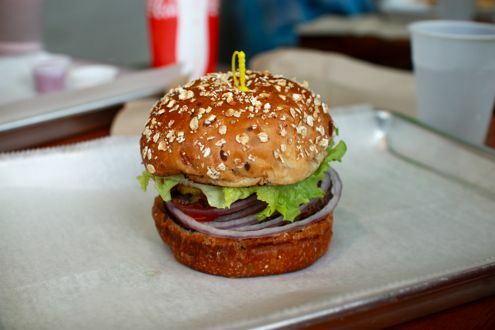 The addition of Kraze Burgers would make this Bethesda’s fourth burger-focused outpost, following in the footsteps of BGR, Fresh Grill, and Five Guys. And that doesn’t even include all of the full-service restaurants that offer burgers on their menu, but we’re way too lazy to list all of those (though Freddy’s deserves some props for their patties). So what differentiates Kraze from the rest of the pack? 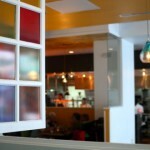 Well, they certainly offer one of the most extensive menus compared to their competitors. Their ordering is broken down into five components: 1) bread, 2) protein, 3) cheese, 4) free toppings, and 5) additional toppings. 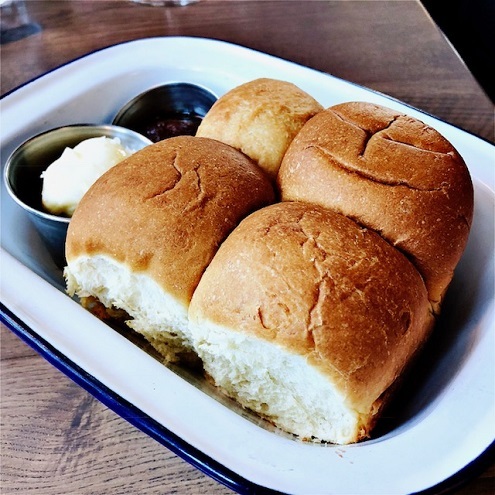 Kraze offers three different types of fresh-baked buns, even offering a “bowl of greens” option for those who decide to go bunless (for a nominal fee of 95 cents). 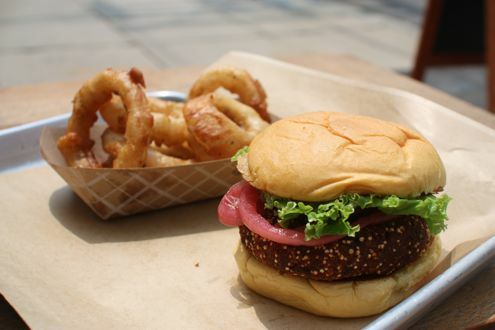 As for proteins, they offer all-natural hormone-free beef, turkey, grilled tofu, and vegetarian patties. Cheeses consist of the usual suspects (American, provolone, bleu, Swiss, mozzarella, and cheddar) while additional toppings range from grilled pineapple to a fried egg. 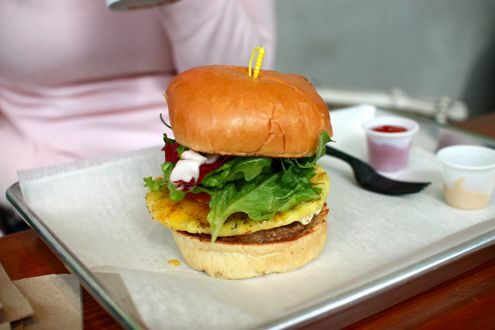 And while you can build your own burger, Kraze offers more than a dozen of its own concoctions. I happened to order their best-selling burger, The Matiz. It featured grilled onions marinated in their house BBQ sauce, American cheese, bacon, lettuce, tomatoes, mayonnaise, and pickles, all stacked on a freshly-baked bun. The burger was juicy and flavorful, but it was the grilled onions that really stood out thanks in part to the BBQ sauce. 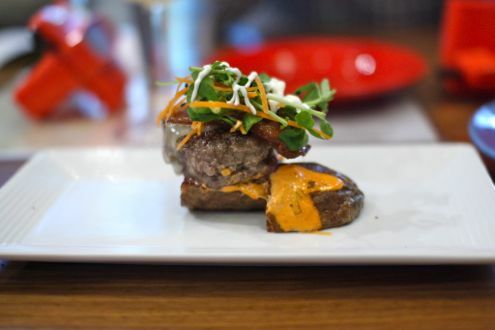 It gave the patty a hint of Asian flavor due to its tanginess. The bun was also noteworthy as it kept the burger intact without getting soggy, yet was soft and even had a little bit of sweetness to it. Rachel did a build-your-own option since none of the combinations really appealed to her. She ordered a beef patty on a multigrain bun, lettuce, tomato, pickles, sweet onions, grilled mushrooms, and ketchup. She enjoyed her burger and thought that the multigrain bun added some texture but felt that the bun would have probably gone better with a veggie or turkey burger. The mushrooms were a nice added topping, and maybe she’ll be more a little more adventurous next time. We also shared an order of fries as well as a side of grilled asparagus. Kraze certainly offers some of the most health-conscious items for a burger joint. Despite eating a burger, I didn’t feel bogged down the next few hours as the grease was kept to a minimum. The prices are also fair. 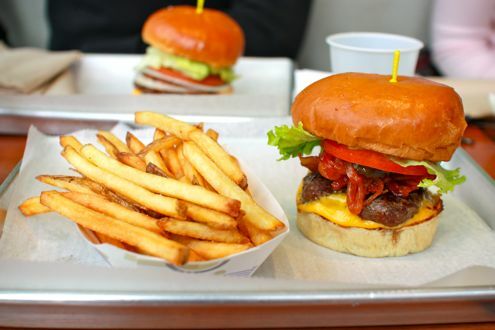 Burgers are around $7 each, and while that’s not Five Guys pricing, you’re also paying for better quality. It was certainly evident in the ingredients. 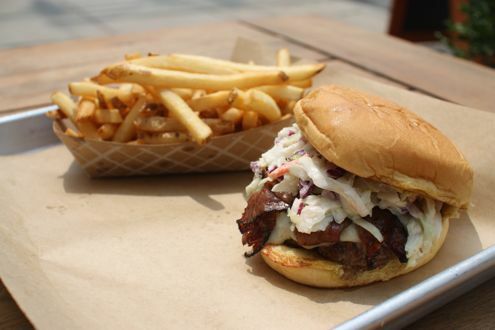 While Bethesda now has a plethora of burger options, Kraze is a nice change of pace from your typical cheeseburger. A few months ago, my coworker told me about this great special at the Greenbrier Resort in West Virginia where, during the offseason, local residents can book a two-night stay for a fraction of the price of a regular visit. Brett and I hadn’t heard much about the resort, but we decided to go as a nice winter getaway for the weekend. It was definitely a relaxing trip and we were glad we went, but we were a little disappointed in the dining options. Two of the restaurants at the Greenbrier were closed for winter cleaning, so that left us with a stuffy formal dining room, an extremely pricey steakhouse, or a mediocre comfort food restaurant (Draper’s). After a dinner at Draper’s, we decided that there had to be more options, so off we went to explore the nearest town of Lewisburg. 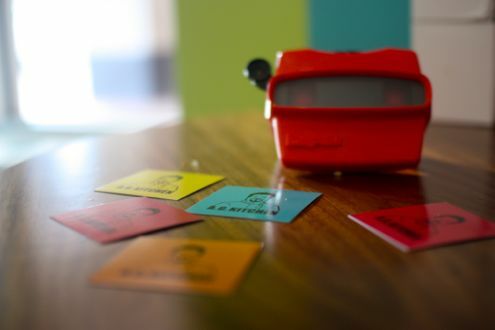 We decided to try Stardust Café because of its universal praise on TripAdvisor as well as its eclectic menu. Needless to say, we made the right choice. I should mention that Lewisburg is this cute little town with one main street. You’ll know you are close when you see a sign that says: “Lewisburg, Voted America’s Coolest Small Town!” We had made reservations earlier in the day, although it clearly wasn’t necessary as there were very few people in the restaurant. Granted, this was also a Monday night in January. The place was small, romantic, and just what we were looking for. 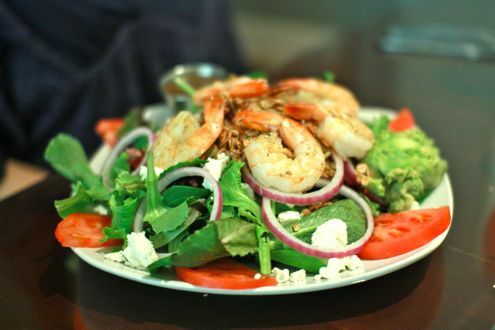 The staff was incredibly friendly and helpful, and everything on the menu sounded appealing. 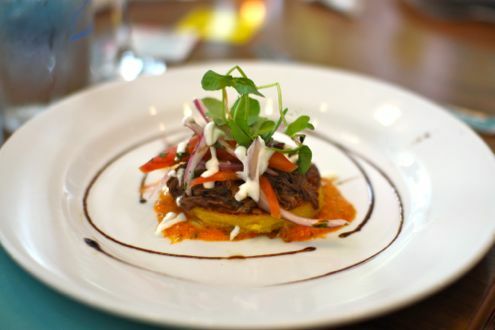 Their philosophy to only use local and sustainable ingredients was definitely apparent throughout the menu. They also had a great drink list as well, as I got their concoction of a “wine fizzy” while Brett ordered a Rogue Mocha Porter. After eating a heavy chicken pot pie the day before, my eyes lit up at the description of the “Trust Me Salad”: fresh greens with local spring mix, tomatoes, red onion, chevre goat cheese, sprinkled with crunchy grains, nuts, seeds, and topped with avocado. I added shrimp to top it off and it was the perfect dish. They were right, you really had to trust them on how the ingredients go together, but they really did. Between the creamy avocado, goat cheese, and the crunch of the grains, I was a happy camper. Brett’s ordered the seared sesame ahi tuna to which he immediately fell in love with. There must have been at least two dozen pieces of center-cut filet on the plate, beautifully arranged and flawlessly cooked. 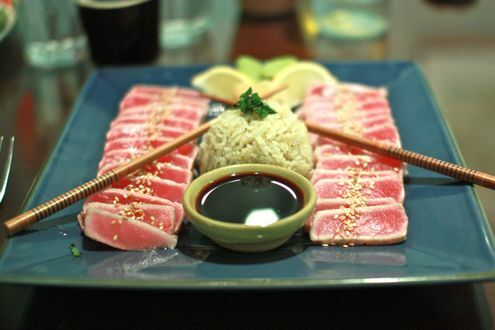 When one thinks of excellent fish preparations, land-locked West Virginia typically doesn’t come to mind, but this was one of the best tuna dishes we have come across. The attention to detail was a nice touch as even the wasabi was formed into miniature leaves. We were full but couldn’t pass up dessert as they are all made by the Crazy Baker, aka the owner’s twin brother. We had to try the sticky toffee pudding as they claimed it was his signature item. In one word: wow. 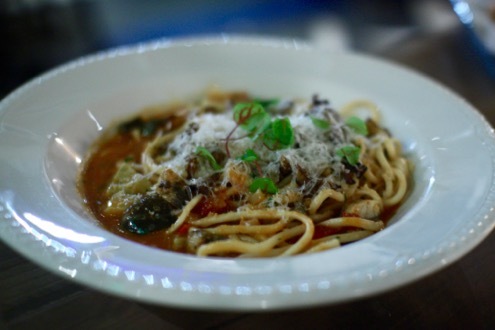 We were blown away by how simple the dish looked yet how wonderful it tasted. 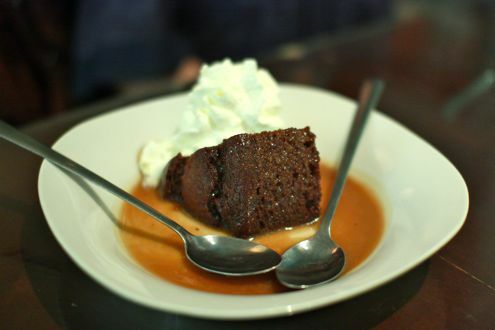 Essentially a date cake topped with hot caramel sauce, we were scraping every last bit off the plate. We loved the food and atmosphere so much that we actually decided to come back and have lunch before we made our way back to Maryland. 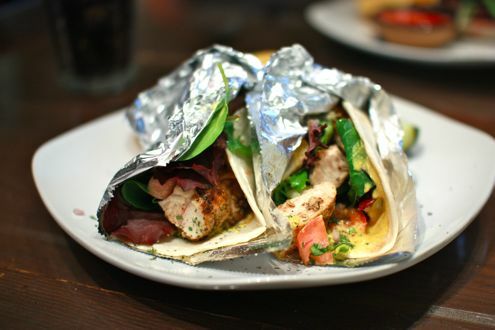 Between the local grass-fed burger and the curry chicken tacos, Stardust once again did not disappoint. Granted, this may not be a place you would drive four-plus hours out of your way to go to, but if you are ever in the Lewisburg area of West Virginia, we highly recommend the Stardust Cafe. It’s a great place to go for Valentine’s Day, or any day of the year! The redevelopment of College Park has long been overdue, but it’s finally coming to fruition with the addition of several mixed-use developments along Route 1. From University View to The Varsity, the landscape of downtown College Park has changed dramatically from when I first attended as an undergraduate back in 1999. With so much retail space now available in a prime location along a major thoroughfare, restaurateurs are taking advantage of the opportunity as there are thousands of customers just footsteps away from their businesses. From ChiDogO’s to Austin Grill Express to a soon-to-be-opened Sweetgreen, College Park looks far different compared to a decade ago. One of the major highlights of the redevelopment thus far is the newest location of celebrity chef Bobby Flay’s burger joint. 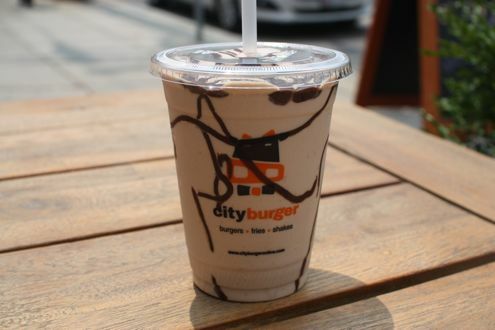 Having just opened Bobby’s Burger Palace in K Street last summer, the College Park location followed suit just a couple of months later. My friend Scott and I headed over to Bobby’s last week for a pregame meal before the Maryland basketball game that evening. Apparently we weren’t the only ones with that idea as the line was nearly out the door, although it did move at an efficient pace. The basic burger starts at $6.75, but varieties such as the Miami Burger or Buffalo Style Burger will only cost you a dollar more. 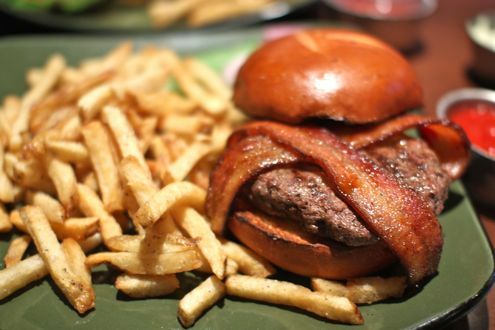 You can also have your burger “crunchified”, meaning the kitchen throws some potato chips atop the patty. They also offer a rotating Burger of the Month, which is what I decided to try. 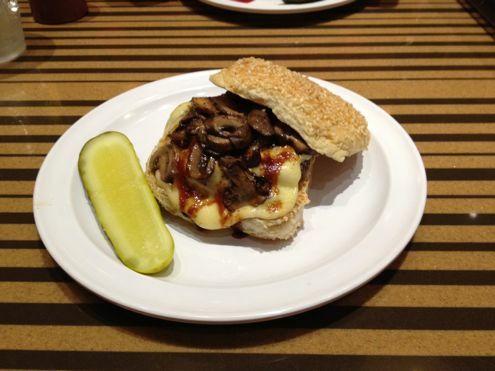 For December, that meant a Pacific Northwest Burger: white American cheese, cremini mushrooms, and a red wine BBQ sauce. I asked it for it to be cooked medium, and also got a side of sweet potato fries too. The cashier gives you a number, and then they bring your meal to your table when the order is ready. When the burger arrived, Scott instantly remarked how the kitchen “torched” my burger. He was right – the patty was well-done. Meanwhile, his medium-rare burger was prepared the way he asked, so I’m not really sure what happened there. On top of that, we both received our orders of fries a minute or two after they had served the burgers instead of all at once. Rather odd. I would have sent the burger back, but we were short on time and the kitchen appeared slightly overwhelmed due to so many customers at once, so I just tried to enjoy it. The beef was of good quality, but it was the combination of the mushrooms, cheese, and BBQ sauce that was able to detract from the well-doneness of the patty. The bun, however, was disappointing as it was limp as soon it got to the table. The bottom half was especially soggy, so between that and the overcooked beef, it was a fairly pedestrian burger. 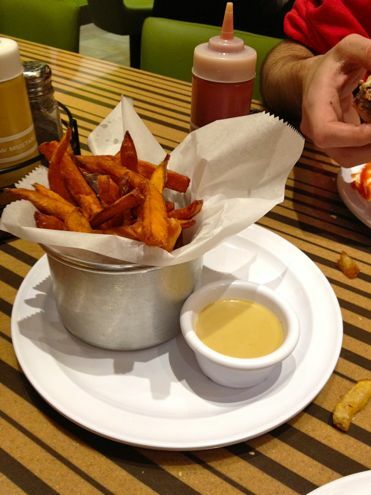 The sweet potato fries were fair, and while they were priced at $3 a serving, at least you receive a decent amount of them. The honey mustard horseradish sauce was a nice touch instead of reaching for the ketchup bottle. 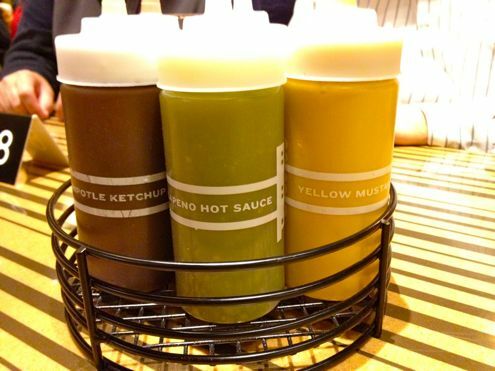 Speaking of which, Bobby’s offers nearly a half dozen sauces to top your burger with. The “burger sauce” might have been my favorite, with the chipotle ketchup as a close runner-up. Our meal cost a little less than $24 for two burgers and two orders of fries. Not a bad value for two people, but honestly, I would take Ray’s Hell Burger any day of the week over Bobby’s. 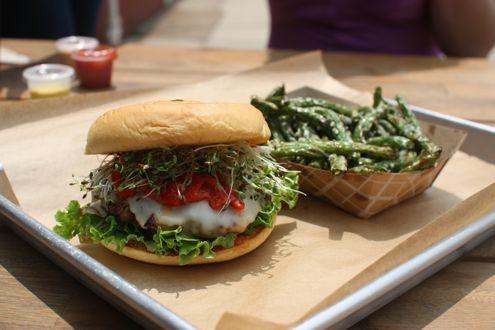 If Flay’s burger joint was the only game in town, then sure, but there are so many other places in the DC area that serve up a better burger for around the same price with much better quality and consistency. As for pregame meals, I’ll be sticking with Fishnet for the foreseeable future. I feel like I have been on a burger kick lately, and I’m perfectly okay with that. I might be catching up from all my years of burger deprivation, and have been trying to go to all of the great places in this city that offer burger specials. Last week I went somewhere that you typically wouldn’t associate with burgers, but then again, you would also be depriving yourself of an awesome burger and an even better deal. The place? None other than Dino in Cleveland Park. 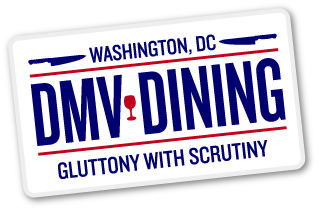 Whenever I’ve thought of Dino, I think Italian food, great Restaurant Week deals, and Passover menus. Now I can add burgers and a great happy hour to the list too. I got there in time for their happy hour and had some complimentary snacks of olives, duck pate, roaster red pepper, and olive tapenade before my friend arrived. I ordered the Raven beer from Baltimore-Washington Beer Works for only $4, and then we got down to the real reason we were here. Every night, Dino offers their “Burger and a Brew” deal. 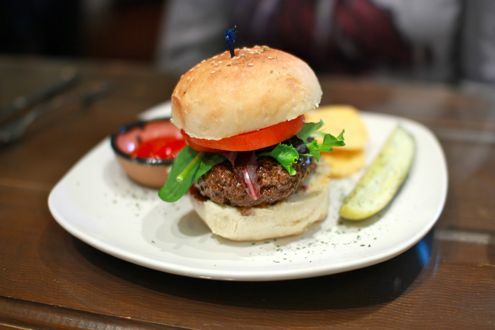 That’s right, you can order a pint from their selection of craft beers and a 10-ounce farm-aged beef burger with an accompanying mixed greens salad, all for $12. My burger came prepared medium, and was incredibly juicy and flavorful. 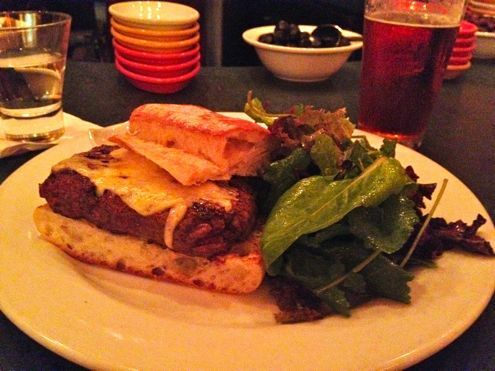 It was topped with house pickle relish, anchovy and sriracha aioli, crucolo cheese, and piled on a ciabatta bun. 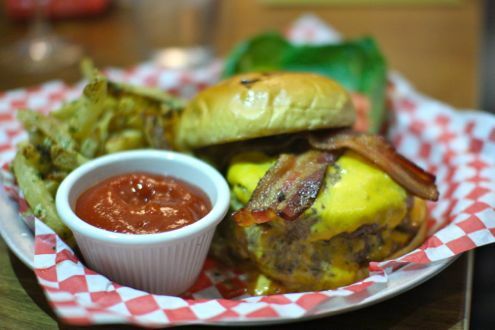 Livya ordered hers with bacon and remarked that it brought the burger to another level. It was a very thick cut of meat, and Brett was greeted that night with both of our leftovers so he got to try his share as well. While we were eating our burgers, I was definitely eying some other dishes brought to customers at the bar. It’s been years since we’ve been back to Dino for a proper meal, and we’ll definitely have to go back for a nice dinner or brunch. I must say though, it will be hard to resist that burger. If you’re in the neighborhood and have a hankering for a burger and a beer, not only is it a steal, but it’s simply delicious. While we have written about Palena Café in the past, I felt that it deserved another post since this was the first time the two of us have dined there in years. Earlier that evening, we participated at a fantastic wine tasting at nearby Weygandt Wines in recognition of International Champagne Day (post forthcoming). After meeting fellow bloggers and sipping on several varieties of champagne, we decided Palena Café would be an optimal destination for dinner given the convenient location as well as the reasonable prices. 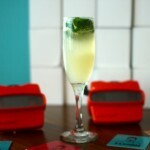 Knowing that it was Friday night and all, we were prepared for a bit of a wait. There were plenty of seats at the bar, and much to my delight, Founders Breakfast Stout was on tap! If there’s a beer that can help pass the time, especially on a cold and blustery evening, it’s a glass of this brew. We were seated at our table 20 minutes later, but deciding what to order took less than 60 seconds. The two of us had already agreed that one would order the cheeseburger while the other would get the Palena chicken. These are essentially the requisite dishes when dining at Palena, and we wouldn’t have it any other way. While an order of bread is a nominal fee, we ordered it anyway since the chicken takes at least 30 minutes to prepare, plus we were starving. But let me tell you, the chicken is worth the wait, but more on that later. I first have to discuss Palena’s magnificent burger: it is one of the very best you will find in DC, period. 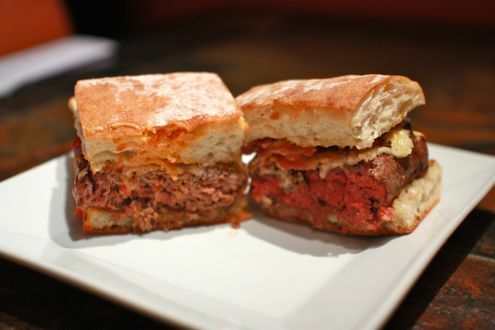 Seven ounces of angus beef cooked medium-rare, a slice of Sottocenere al Tartufo cheese, and house mayonnaise all sandwiched by a housemade brioche bun. Simple yet effective. The burger-centric blog Burger Days does a better job of summarizing Palena’s burger than I ever will, but for $12, this patty is well worth it. All of the ingredients work so incredibly well with one another that it’s one of those burgers you just can’t put down. Highly recommended. As for the chicken, I’m in total agreement with Rachel about it being flawlessly cooked. 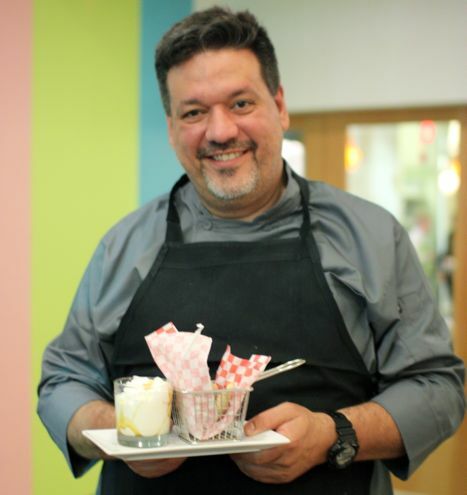 People tend to think that chicken dishes are typically boring, but Chef Ruta works wonders in the kitchen by delivering a chicken that is juicy and flavorful. 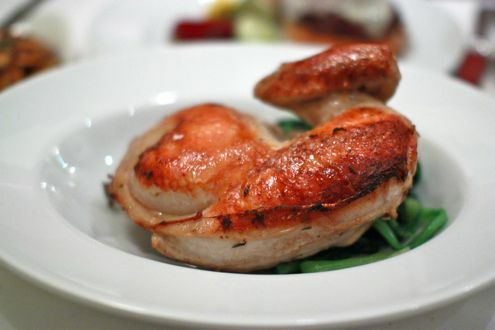 Featuring a delightfully crispy skin and accompanied with a side of lemon-braised greens, it’s a great value for $17. 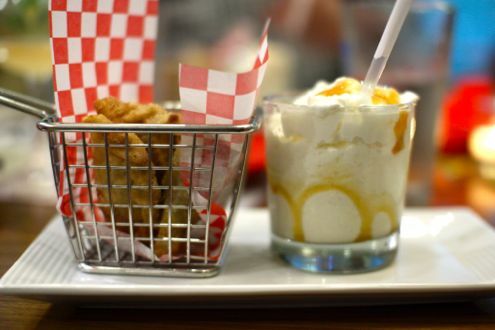 After polishing up both of our entrees, the waitress handed us the dessert menu, and after looking over the ingredients of the Autumn Sundae, it proved too difficult to resist. 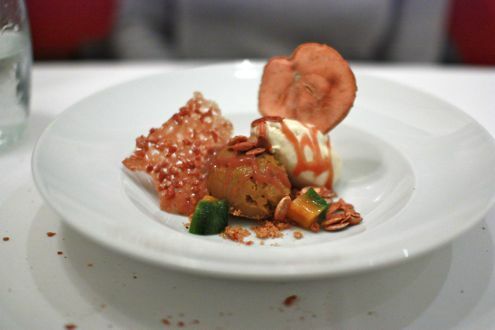 Featuring squash sorbet, apple ice cream, pumpkin seeds, and bourbon caramel sauce, the dessert encapsulated the fall season on one plate. All we needed was some fall foliage instead of the cars driving by on Connecticut Avenue, but regardless, it was a phenomenal dessert. Friday night’s dinner was perfect in every way. 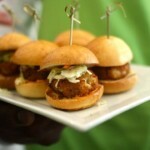 From the chicken to the burger to the seasonally-apt dessert to even the beer on-tap, everything was just excellent. How Rachel and I have not been to Palena more often is bewildering, but after tasting that burger, I think monthly visits are mandatory. 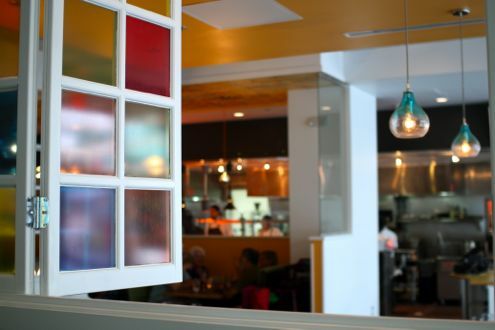 Tucked away from the bustling activity of downtown Silver Spring, Quarry House Tavern offers an escape from suburbia. It’s hard to imagine that a bar filled with such charm and character is mere blocks from the commercialization of nearby City Place, yet Quarry House Tavern is the dive you’ve always been looking for. It’s not the easiest place to find, but once you walk down the flight of stairs, it’s hard not to leave. Not only does the bar host over a hundred beers and whiskeys, but they also feature three varieties of tater tots. Need I say more? 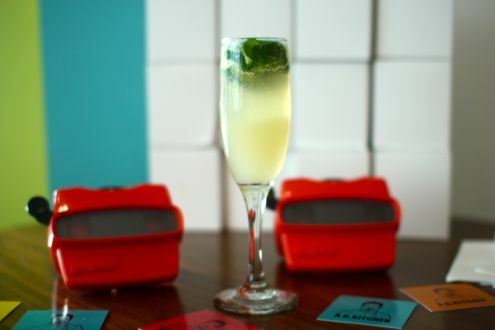 Restaurateur Jackie Greenbaum, who also operates nearby Sidebar and Jackie’s, has given her establishments an identity that is hard to replicate. Combine that with the fact that she is able to stock the bar with a variety of craft beer while dealing with Montgomery County’s arcane liquor laws is a success in its own right. The bar features a selection of draft beers that change throughout the day in addition to an enormous bottle selection that consumes the majority of the menu. 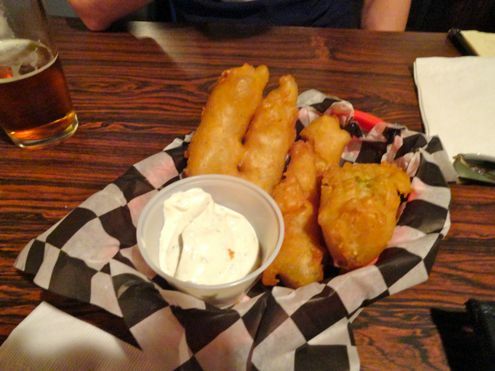 Rachel and I ordered a couple of beers before splitting an order of fried pickles, because let’s face it, how could you not order fried pickles? The spears were surrounded by so much thick, crunchy batter that it was hard to decipher if there were pickles under there or not. Nonetheless, we wasted no time finishing them off, even though we had to scrape away some of the breading. The main event, however, was the burger. 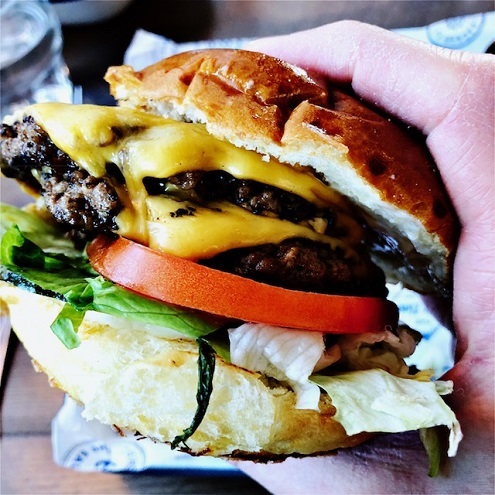 Quarry House Tavern is known for serving up some of the best patties in Silver Spring, and after we polished ours off, we can wholeheartedly agree. We ordered our burger medium, topped with American cheese, grilled mushrooms, lettuce, tomato, and raw onion. Served with a side of tots, it’s arguably one of the best meals to pair a beer with while listening to The Smiths blaring on the jukebox. The beef was juicy, well-seasoned, and cooked exactly the way we asked. 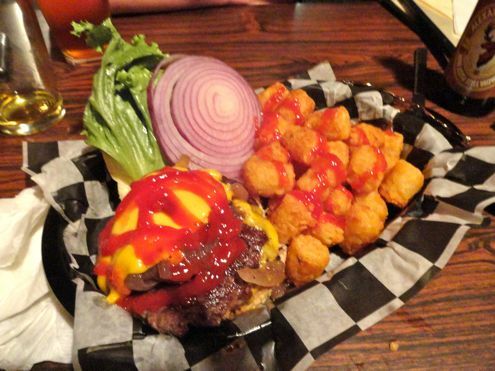 The tots are great as well, though I would have needed a side of Coumadin if we got them topped with bacon and cheese. 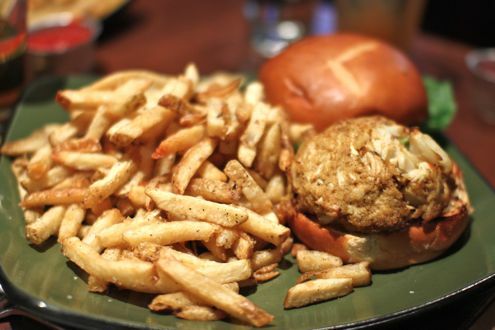 Overall, Quarry House Tavern is a diamond in the rough in Montgomery County. Between the fantastic beer selection, great bar food, and divey atmosphere, it’s one of our favorite watering holes in the area.